Lysis refers to the breaking down of the cell, often by viral, enzymic, or osmotic mechanisms that compromise its integrity. A fluid containing the contents of lysed cells is called a "lysate". Cell lysis is used to break open cells to avoid shear forces that would denature or degrade sensitive proteins and DNA. Cell lysis is used in western and Southern blotting to analyze specific proteins, lipids, nucleic acids, reporter assays, immunoassays, and protein purification. Depending upon the detergent used, either all or some membranes are lysed. If the cell membrane only is lysed then gradient centrifugation can be used for collecting organelles. 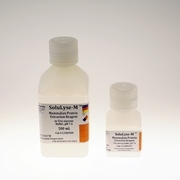 SoluLyse-M� Mammalian Protein Extraction Reagent is a novel nonionic detergent designed for efficient whole-cell protein extraction from cultured mammalian cells. It gently and rapidly dissolves cell membranes at low concentrations without denaturing proteins. 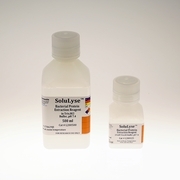 SoluLyse� Protein Extraction Reagent is a proprietary formulation of nonionic detergents that is optimized for the most efficient extraction of soluble proteins from bacterial cells. It allows perforation of bacterial cell wall without denaturing proteins, and there is no need for secondary treatment such as sonication or freeze-thaw. Authors: Pawel Listwan, Jean-Denis P�delacq, Meghan Lockard, Carolyn Bell,1 Thomas C. Terwilliger, and Geoffrey S. Waldo J Struct Funct Genomics 2010 March; 11(1): 41�49.